I don’t do this often, but yes I’m going to rant once again about warlocks having the floating Soul Shards above our heads. 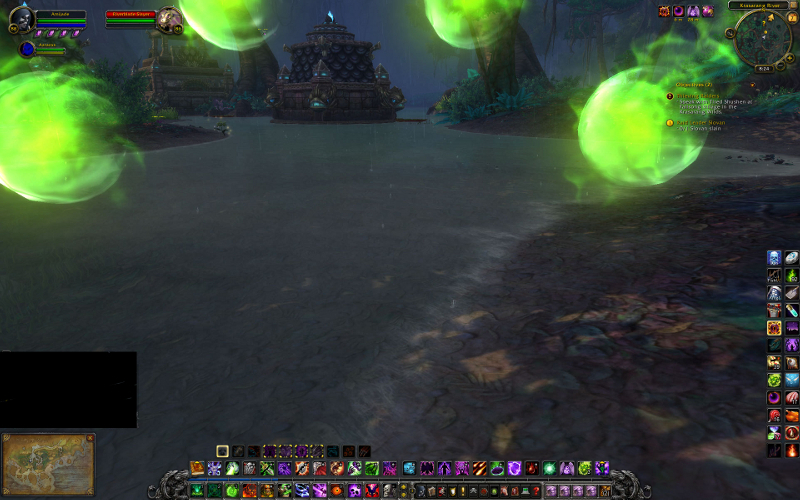 If you remember, back in early April, I wrote the post MoP Beta – Floating Pink Shards? Yes, I’m writing about them again. Yes, I know we can choose two different minor glyphs that can change the way they look. First we have the Glyph of Subtlety. This glyph makes them disappear out-of-combat, but if you do a lot of questing and dailies the annoying things are still there all the time annoying the heck out of you. Then we have the Glyph of Verdant Spheres which simply turns the pink, floating cotton-candy looking shards into green orbs that always look like they are in a windstorm. Omg, I dislike them terribly. Okay, dislike isn’t strong enough for my feelings on this matter. I really do mean to say that I hate them. Ugh, hate is such an ugly word, but dammit I really do hate these things! For the folks who like them, I understand why you like them. I understand there is lore behind them. I understand that you like they way they look and I’m more than happy to let you wear them. But please, for the love of Hellfire and Green Flames help me to get Blizzard to see that if you want them, then you can simply glyph for them. By default you shouldn’t see them at all like in Vanilla WoW, or in the Burning Crusade, or in Wrath, or in Cataclysm! If you want the pink ones or green ones then the player can simply glyph for them. Done! Easy fix! Yes, I have voiced my opinion nicely and in a constructive way on the forums about this issue too and sadly there has been no comment or Blue Post from Blizzard about them. They show your enemy your status – Shouldn’t rogues have combo points floating above their heads or DK’s with floating runes? If the mechanic becomes such that your enemies aren’t allowed to see them then what’s the point to them? What is the point of them other than something new? We can’t have green fire but we can have these things? They blend too much with the pink and purple colors of our Malefic Grasp and Drain Soul spells (which we use a lot in Affliction) – so again what’s the point to them? They are pink, and fluffy, cotton-candy looking – What warlock wants to see anything pink on anything other than in entrails of their enemies? They completely ruin the look your transmog gear – Yeah, my black outfit looks absolutely dumb with pink tufts…ugh! Maybe if I was a powder-puff girl! They look goofy on all of the race models, except for maybe Belfs. If I was a Belf maybe I could live with them, but on my undead they hang right in front of my face! They ruin your view when you zoom in to take screen shots in first person! The things I HATE, LOATHE, and DESPISE in MoP Beta. What a view they give eh? Makes for a nice screen shot doesn’t it? Bah! So for any action shots where I’m trying to pull my avatar out of the picture to focus on the action it won’t happen because all you will see is the image above. I even tried using the Eye of Kilrogg to take a picture, but I forgot that our minion disappears when you summon the Eye of Kilrogg and of course if you enter any combat it breaks the channel of the Eye anyway. Bah! Yes, I know I can resize and cut my own image out of the picture, but why should I have too? Why can’t I use the entire screen surface as my canvass like I do with all of my other toons? I love my warlock, truly I do, but I hate this pain-in-the-rear worthless graphic animation! Sorry for the rant everyone! Now that I’ve gotten out of my system I do feel better…but I still hate those things! Hahaha! Yep I know Clumsy :P I was being snarky on my end there. While I’ve been trying to stay away from most beta info the second mention of shards caught my attention. Must be important so I’d better read it! THEY INTERFERE WITH SCREEN SHOTS??? Are they insane? I don’t need no stinkin globs of pink messing up my screen shots! And Warlocks don’t do pink! OMG! Now I’m hyperventilating! Stop the madness! You are so funny! Trust me, there’s no need for an intervention yet. It’s still Beta and things can still change. Well if you don’t like pink you might like the green orbs? There are only two times where they are interferring with Screen shots. The first way, is if you are zoomed into first person view and do not have the Glyph of Subtlety. Without the glyph you will always have the shards/orbs floating on top of your head. Yes, I mean always too. With GoSub enabled it makes the shards/orbs disappear when you’re out of combat, but they reappear the second you enter combat. The second way they interferre is if you are zoomed into first person view and are in-combat. Currently, there is no way to disable them during combat so if you are wanting to take action screen shots while you’re fighting you will see them in your view. However, if you check the forums you will see just as many people that like them as compared to those who don’t. The shards/orbs have been there since I was allowed into Beta in early April and it doesn’t appear they will be changing it anytime soon. Now please don’t get me going about what it does to a transmog set because then I’ll be hyperventilating! Thanks for your comment girl, I hope your well.